Molex, a leading global manufacturer of electronic solutions, introduced their LumaLink MPO Optical Trace Cable Assemblies, designed for use in data center rack frames and cable trays. 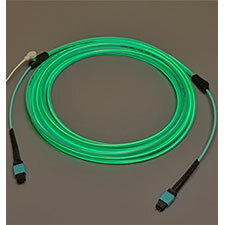 LumaLink Optical Trace Cable Assemblies feature high-density MPO connectors and full illumination of the entire cable to facilitate advanced cable management. The cable’s illumination function provides complete visual identification from origin-to-endpoint as well as slack storage locations, and helps installers and technicians identify, implement and route MPO cables more easily. For more information about Molex’s LumaLink Optical Trace cable assemblies, please stop by Molex booth 606 at the upcoming European Conference on Optical Communication, Sept 24th- 26th in Rome, Italy or, please visit: www.molex.com/link/lumalink.html.